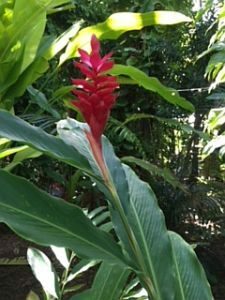 Gingers are native to the tropics, some subtropics and are members of a large family (Zingiberaceae) of varied flowers and forms. Most Gingers usually have large leaves with varied flowers that are scented. They are close relatives to bananas, cannas and marantas. They offer an exotic tropical look to the garden or plantings in warm areas. In our area plant Gingers in part sun/part shade. 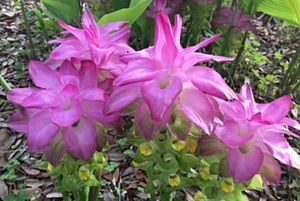 They do best with a few hours of sunlight a day or when planted under trees or along streams but are not salt tolerant. They do not do well in the intense heat of the day. Gingers are produced from rhizomes and form clumps They need to be divided periodically to thrive. Plant rhizomes just below soil surface with roots downward and spaced about 30 inches apart. They enjoy moist well drained organic soil. Some go dormant in the winter and some are evergreen. Some are tall to 8 feet tall and others are short depending on the species. Tall vegetation may be cut back in winter after blooming when unsightly or falling over but they do not have to be cut. Fertilize monthly with a complete fertilizer if needed. Depending on the species, gingers bloom during various times of the year but usually late spring to late summer. Protect them from strong winds. Plant tall gingers in the back of the plant bed. Few pests bother gingers. Blooms make striking and unusual cut flowers for arrangements. 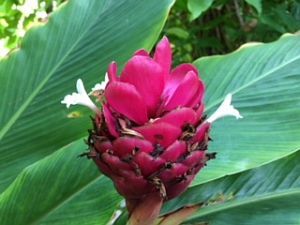 There are many varieties of gingers including Hidden Ginger, Pinecone Ginger, Scarlet Ginger, Shell Ginger to name a few. 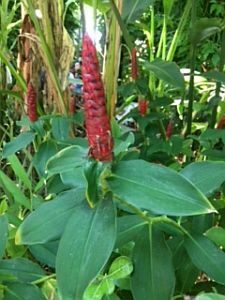 Always read instructions and plant labels to pick the best ginger for your garden.